PSG dominated by constantly attacking effectively down the left, and Chelsea relied on Thibaut Courtois to secure a valuable away draw. Laurent Blanc was without the likes of Thiago Motta, Yohan Cabaye and Lucas Moura through injury, which caused him problems in midfield – although the fact Blaise Matuidi was fit to start was a huge boost. Blanc played David Luiz in midfield for the first time with Marquinhos coming into the defence, and Edinson Cavani returned to the attack. Jose Mourinho went cautious in midfield, bringing in Ramires and moving Cesc Fabregas to the top of his midfield trio, with Oscar omitted. Gary Cahill replaced Kurt Zouma, and Thibaut Courtois returned in goal, despite Petr Cech excelling against Everton last week, and Diego Costa played his first game in three weeks as he’s currently serving a domestic suspension. This was cautious and cagey in the beginning, before gradually opening out – although neither manager was adventurous enough to make attack-minded changes and go for the victory. With both managers being conservative in the centre of midfield, there was very little creativity from central positions all game. Nemanja Matic sat deep and Ramires occupied the space to his right, while Fabregas simply didn’t seem fit enough to have any influence, offering very little in an attacking sense. PSG had guile in the form of David Luiz and Marco Verratti in deeper positions, but they rarely looked for penetrative balls into the forwards, and instead played long diagonal passes out to the flanks. It meant the midfield zone was largely neutralised, and the interesting battles were all taking place out wide. 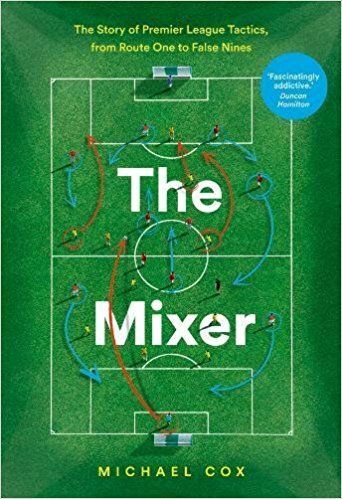 This felt like an old-fashioned, stereotypically cautious game between two sides largely playing on the counter-attack. But while both were playing on the break, they weren’t particularly good at guarding against the opposition break: neither pressed well when they lost possession, and both pushed their full-backs forward to leave their centre-backs exposed to pace down the flanks. Chelsea’s main attacking approach – arguably their sole attacking approach – was relying on Eden Hazard’s pace on the left. His direct opponent Gregory van der Wiel is a typically Dutch full-back, always getting extremely tight to his man, and Hazard often found it difficult to turn. He also suffered from a ludicrous number of fouls – nine – mainly from van der Wiel and Verratti, who covered when Van der Wiel skipped forward into attack. Indeed, Van der Wiel’s attacking positioning was the game’s most interesting tactical feature in the first half – he was constantly free, but poor touches meant he failed to exploit that freedom. 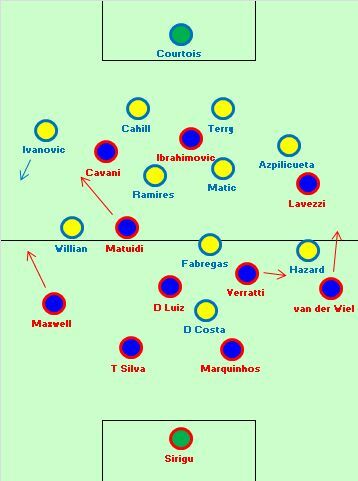 This was the game’s key battlezone, with Hazard – whose positional indiscipline cost Chelsea in last year’s semi-final against Atletico, when Juanfran motored past him to create two goals – seemingly unsure whether to track Van der Wiel, or stay in a position to counter-attack. Eventually, Mourinho switched Hazard and the more defensively aware Willian, who did a better job on Van der Wiel. Whether this was an astute move, however, is highly debatable, because PSG became more threatening down the left. PSG also started by attacking on the break, and the game’s first two chances came following a PSG move down that flank, into the space left behind by Branislav Ivanovic’s extremely high, wide attacking position on the right touchline. First Cavani crossed to Blaise Matuidi, then seconds later Matuidi found space to whip the ball in towards Zlatan Ibrahimovic. Courtois saved twice. The more the game continued, the more it became obvious that PSG were only truly threatening down that left flank. They didn’t have genuine creativity in midfield, with Ibrahimovic effective when dropping deep, but doing so frustratingly infrequently. Down the right, Ezequiel Lavezzi and Van der Wiel were simply too clumsy in possession to contribute anything, so it was all about the left. Cavani usually played to that side, but the real key factors were Maxwell advancing steadily from full-back – he played more passes in the final third than any other player – and Matuidi, who was the game’s outstanding player. Matuidi is an unusual footballer, probably best compared to Ramires, because he’s all about energy and specialises in shuttling forward from a midfield three to provide a presence on the flank. That was crucial here, with the midfield a gritty battlezone and the game all about the contest in the wider areas, and he constantly provided overloads with Maxwell, either in the inside-left channel or on the outside of the full-back. Matuidi isn’t usually a creative player, but he was in this game, creating more chances than any other player, including the assist for Cavani’s headed equaliser. This was absolutely typical of the game, and one of the interesting things was the fact Chelsea’s centre-backs were so far apart as Cavani struck. There was a reason for this – PSG had frequently looked for deep crosses for Ibrahimovic, towering over Cesar Azpilicueta at the far post. John Terry dropped too far back to guard against this problem, the space between he and Cahill was too large, and Cahill’s hand gesture as the goal went in illustrated this – he was essentially asking why Terry was so far away. Cavani is excellent in the air, and while he’s not really suited to a wide role, this shows the value of having a striker in that position – he can provide a secondary penalty box presence. 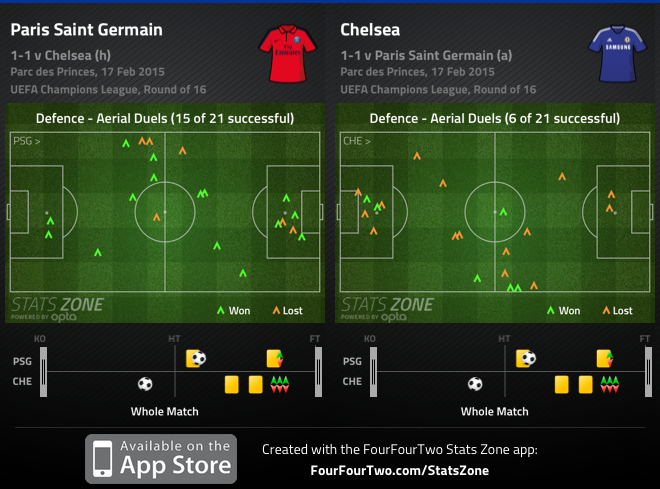 PSG dominated aerially all evening. Incidentally, while the PSG goal was typical of their attacking approach, it’s difficult to find a more unlikely source of goal than Chelsea’s opener. In the second phase of a set-piece, Terry crossed, Cahill flicked the ball on, and Ivanovic headed into the net – three defenders combining. Blanc said afterwards that he’d spent all week focusing on stopping Hazard, Willian and Diego Costa, then three defenders combined for the goal – “the magic of football”, he said. PSG’s other good chances also came from the left, although often in the channel rather than through crossing – both Ibrahimovic and Cavani had one-on-ones from a narrow angle against Courtois, having exchanged passes with Lavezzi and Matuidi respectively. As if to underline the fact both managers were happy with their solid shapes, and a tight game, neither made any changes until 80 minutes. They were all essentially straight swaps, although Javier Pastore on for Lavezzi offered a little more creativity. 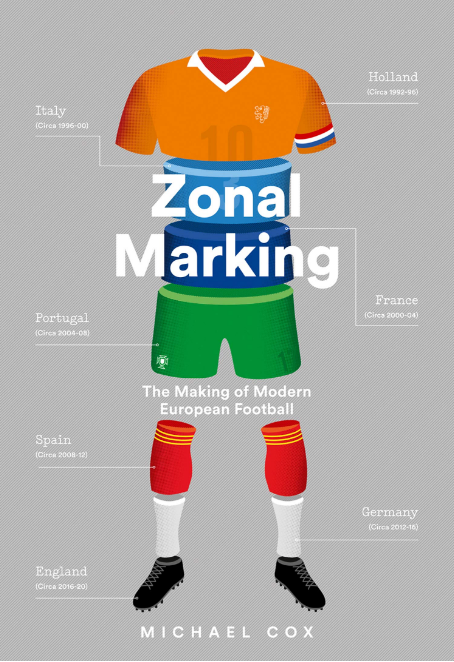 Still, the previous pattern remained, and as Maxwell crossed from the left and Ibrahimovic’s header forced Courtois to make a diving save in stoppage time, the game was summarised neatly. In terms of scoreline this was a classic away performance from a Mourinho side, but in reality Chelsea conceded far more pressure than they would have liked, and PSG had a number of good opportunities. With Chelsea’s major problem coming down their right flank, a better strategy – with the same players – might have been to shift Fabregas back alongside Matic, and push Ramires onto the right flank, with Willian left and Hazard playing in a central role. Fabregas’ defensive qualities aren’t particularly good, which is why he was pushed forward here, but there wasn’t much danger of PSG creating anything from between the lines anyway, and Ramires’ energy might have been better used in the zone PSG were threatening in. PSG will be encouraged by the number of chances they created, and they might be even more threatening on the counter-attack in the second leg. I was surprised Blanc didn’t push Verrati forward in the second since Chelsea seemed content with their goal. Mourinho has developed a knack for defending away from home, especially with a goal in hand, and with so much pressure being applied to the right channel, I felt as though Verrati should have swapped sides with Luiz, have Luiz sit in, and Verrati would have been the straw to break the camel’s back. It’s not as if Chelsea were dangerous in their attacking play, so the gamble would’ve been worth it to me, but I digress. Courtouis seemed to be the deciding factor however and a great call by Mourinho. No disrespect to Petr Cech, but I don’t know if he makes three key saves in that one. Ibra, Cavani and Lavezzi will be perturbed at the opportunities missed thanks to the Belgian #1. Can’t wait for the return leg. i dont know how you rate them but is football only about defense or stopping opposition from playing . to be honest chelsea got away easily yesterday . had PSG coach blanc had a better brain and realised that chelsea were clearly struggling to PSG’s crosses ( PSG’s had best chance in the first half by matuidi’s header and second half cavani’s goal , ibra heading into the turf all on crosses ) then he should had asked his team to put up more crosses and test cahill and terry . that would had been the first plan and blanc could had improvised from there . what ever the writer true blue has said is very correct . but how long is chelsea going to play negative football and hail mouriniho and criticize roberto di matteo for doing the same thing and winning the cup . to be honest to give such rating numbers to the players show your lack of game knowledge and most importantly how many shot they had to show for the ratings that they got . these are comments on espn regarding this game . to be honest there needs a question to be asked to laurent blanc as to why maxwell has more touches on the ball than cavani and ibramovic . when i looked at the game and the tactics that were deployed by blanc then i dont see fault . they were trying to open up the chelsea’s right side and it was a correct direction . both ivanovic and cahill are not that mobile and compound that to matuidi’s running who kept the chelsea rear guard guessing as to whether he was cutting inside or staying wide . but the thing that intrigued me that the most was the lack of crosses when chelsea clearlystruggled with PSG’s crosses . chelsea clearly struggled with PSG’s crosses . even in the first half they had the best chance of matuidi on a cross . which should had be theme of the game and then PSG’s should had improvised at that . at times PSG just couldnt get the ball to ibra who was a frustrated figure . secondly there are three players from the midfield and somebody should had attempted to go beyond cavani and ibra which did not happened . blanc needs to improve his offense and needs to get ibra more on the ball and closer to the opposition goal to create spaces for others and be more effective . Chelsea did, unusually, look vulnerable in the air, and I was somewhat surprised that Cahill started instead of Zouma,who is faster and has a better leap, although less experience. However, assuming that PSG put in crosses at their best opportunities, additional crosses would be of lesser quality and therefore more likely to give up possession. Chelsea are very dangerous on the counter attack from deep, so opponents have to balance the risks and rewards. your comments are making me laugh .additional crosses would be of lesser quality and therefore more likely to give up possession i mean i had never read such a hilarious comment . First, crosses are statistically not the best way to attack successfully. Not only that it is quite hard to address the cross to the right person, it often ends in losing the ball and a chance for a counter attack. That is said in general. However,in certain games crosses can be a good choice because of a vulnerability of the opponent or some similar reason. But Ian is right. Football is about creating good scoring opportunities. More crosses don’t mean more good crosses. Just to hit the ball into the box from the sideline won’t help. It might have the reverse effect, you become an easy to defend one trick pony. And your strikers will wait for the right cross while they see less of the ball instead of more. hey michael can you do the schalke- madrid game . this game was tactical with the way madrid move the ball . Great article on ZM as usual. Typically cagey game, but I expected PSG to go for it a bit more they should be quite disappointed with that result. It was interesting to see PSG creating 3v2 overloads out wide with Matuidi drifting out wide and making penetrating runs through the half spaces, this set up Cavani’s goal. But yeah great read Michael. For a short passage I thought the text was not written by Mr. Cox, but who cares. It reads like both managers were more concerned about not changing anything and screwing things up than enforcing the win with a bold tactical move. First match in the knock out stage, no one takes a risk. PSG can’t be happy with conceding a goal at home and not winning while they might’ve been the better team. Mourinho will be pretty satisfied with the result. Lack of alternatives looked like the reason Cesc got his place, but Oscar’s high press could have created some opportunities up front. He at least offers more mobility. Poor game for Fabregas, but hard to blame him without service.